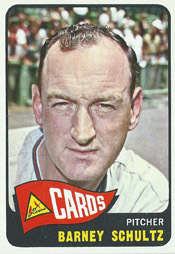 In a matchup critical to the pennant hopes of the Cardinals, Barney Schultz faced Roberto Clemente on the penultimate Sunday of the 1964 season. Two months earlier, Schultz, 38, was pitching in the minor leagues. Clemente, 30, was on his way to the 1964 National League batting title. Who could have imagined the two would be paired in one of the best baseball dramas of the season? On Sept. 27, 1964, the Cardinals faced the Pirates at Pittsburgh, looking to complete a five-game sweep. Four days earlier, on Sept. 23, the Cardinals were five games behind the first-place Phillies and 1.5 behind the Reds. Skinner and Groat, both former Pirates, knew how unlikely it was for any club to accomplish that task at Pittsburgh. However, the Cardinals won both games of a doubleheader versus the Pirates on Sept. 24 and followed that with wins at Pittsburgh on Sept. 25 and Sept. 26. In the series finale, the Cardinals started Roger Craig, who’d lost four consecutive decisions. Craig delivered a stellar start, holding the Pirates scoreless and limiting them to six singles through 7.2 innings. In the eighth, with the Cardinals ahead, 3-0, the Pirates had runners on first and second, two outs, when Cardinals manager Johnny Keane brought in Schultz to face Clemente, who represented the tying run. The odds seemed stacked in favor of Clemente, who hit .361 with runners in scoring position in 1964, but Schultz struck him out. In sweeping the five games at Pittsburgh, the Cardinals played nearly flawless baseball, committing one error and holding the Pirates to eight total runs. The win moved the Cardinals 1.5 games behind the first-place Reds and a half-game behind the fading Phillies. Arriving at the St. Louis airport after their flight from Pittsburgh, the Cardinals were greeted by an adoring crowd of at least 8,000, The Sporting News reported. Back in St. Louis, the Cardinals won four of their last six against the Phillies and Mets, winning the pennant by a game over both the Phillies and Reds.